These pages are aimed for Trucks, Buses, Tractors and other commercial Ford vehicles. The new Ford truck was built for the needs of tomorrow. Cabs and bodies were in rock moss green pyroxylin finish with gray striping. the Express body and the panel body. 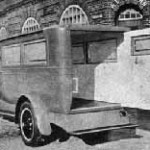 This body could easily accommodate the driver and two passengers.The doors were wide and windows could be raised and lowered by a revolving lift. The seat was comfortable and 44 inches wide and 17 inches deep. Upholstery was brow arificial leather and the floor had a rubber mat. One of the features was the rear window and the rear view mirror. No PB PS AC as we are used with today. A truck with generous loading space and sturdy construction was features of the express body. It was really a “wide bed”, from the floor to the top of the sides was it 12.5 inches. Inside dimensions were width 4 feet and length 7 feet and 2 inches. There were also sockets for stakes, racks or slide boards. Th end gate was made of steel and equipped with heavy chains. The Stake body was wider than express body. The “bed” was 5 feet and 8 inches wide and 8 feet and 1,5 inches long. 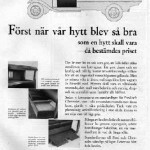 This type of truck was also common in Sweden but the body and bed was not manufactured in the U.S. 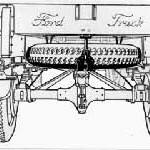 The trucks came as chassis to Ford Motor Company in Sweden or Denmark. Almost 100% of the truck bodies were made here in Sweden. The reason for that was the tax system. The panel body had a total different bodystyle and was constructed of a combination of woodfinished interior and metal exterior. There were two folding seats that gave the driver easy access to the interior of the body. Loading dimensions were width 43 inches, height 50 inches, length 88 inches. The spare wheel was placed on the right side of the body just behind the door of the cab. 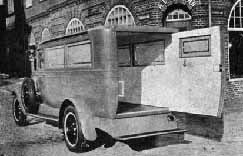 The new Ford light commercial cars were all built on the model “A” chassis. 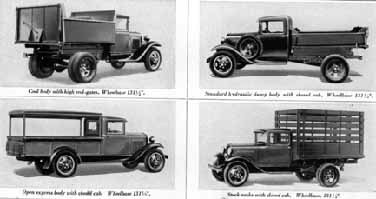 There were several types of commercial cars that Ford did offer. The Pick-Up closed or open, The De Luxe Delivery car and the Panel body car. The Pick-Up body was offered with either open or closed cab. The body was made of steel with heavy floor boards and steel strips to withstand the wear. The size was 40 3/4″ in wide adn 35 inches long, 13 inches in height and the loading capacity was 17 cu. Ft. This car looks like a Tudor without the rear side windows but it is not the same body. They differ a lot. The side “window” is larger than it is on the Tudor. More things differ but lets look at the picture and see how nice this commercial car looks like. 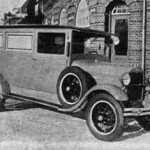 This car was designed for destinctive delivery service and followed closely passenger car lines. The body was all in steel. There was a rear door on this type of car so the sparewheel was placed in one of the front fenders. It also had rear bumpers. Nice little car this Delivery. This car was built the same way as the AA Panle Delivery Truck. The exterior was metal and the interior wood. It had double rear doors and was longer than the De luxe Delivery car. The drivers compartment was fully closed and had two folding seats. 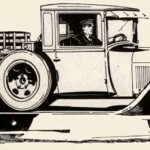 The development went on and 1931 the trucks looked like this in Ford France Magazine. The same magazine also shows tractors and Ford cars. The trucks were sold with arguments as: Quand vous examinez la question du transport èconomique.. Songez au prix de la tonnekilomètriqe. 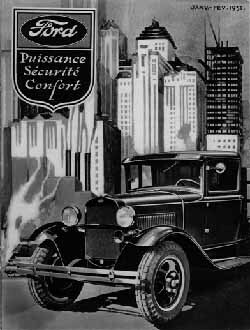 Ford -Puissance -Sècuritè -Comfort. Does anyone want to see more of those interesting pictures please mail us via netclassics@usa.net and just tell us what you would like to see on our pages and we will try to arrange that for you! Just call, write, fax or mail us your ideas. 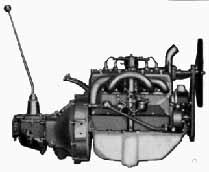 A lot of factories/companies abroad made their own AA Truck bodies and some of them were sold by the Ford Motor Company. In Sweden there was a lower salestax if the car was assembled in Sweden. That was one of the reasons why Ford Motor Comapany almost to 100% imported just the AA chassis from USA. 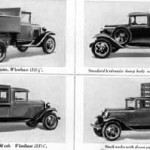 As you can see on following photos from Ford Motor Company A/Bs (Sweden) magazine “Ford världen” 1932 the Swedish AA bodies were different from the American built bodies. 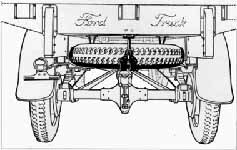 The Ford trucks low maintaining cost and Fords very good technical standards was some arguments that often were used to sell Ford. 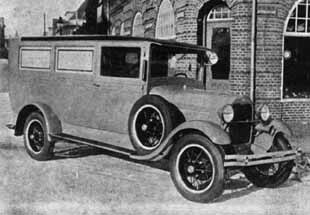 This photo shows one of the AA trucks that was sold during 1932 from Ford Motor Company in Stockholm. The construction of the beds and the size of the cab differs from the American trucks. We normally did build the trucks this way and the narrow or wide beds were almost never used. Compare the cab of this truck with the trucks below . This is a 1930-31 AA sold 1932. It was equipped with black headlights and black radiator shell. AA trucks used by “Olaus Olssons Nya Bilimport” in Stockholm . The front bumpers looks like the bumpers that were used on “normal” Fords, as the Tudor. 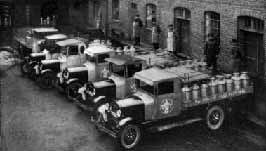 These cars were in daily use to bring fresh bread out to everyone in Malmoe (a quite big town in the south of sweden). The bakery that used those 15 Ford Deliverys was “A/B A.Pålssons Bageri Malmö”. I can`t say if it is US bodies, Danish or Swedish on those cars. Maybe someone knows. Just tell us and we will add the new information to this page. In Malmoe we also find more users of the AA truck as well as the TT-truck.. “A/B Malmoe Mjölkcentral”( Milkcentral ). Here is another cabtype found and the front bumper is not the normal AA-bumper. The hood are painted in black. Can anyone of our Swedish readers tell us something more about this picture? We can se the drivers standing behind the Trucks. Look at the TT truck with the very nice window behind the door. If we look closely we can also see that Truck number two with the black roof has a cab that differs from the first and third one. Ford was obviously selling several Truck cabs and also naked chassis and the customer ordered his own customized cab. It is interesting to talk about what is ORIGINAL . Today we still prefer the American built cars as we feel that those cars are more original but isn`t the Swedish built AA trucks are the most original you can have here in Sweden? I think so. I do hope that someone writes a book about all Swedish bodybuilders. If anyone have any type of information about Truck bodies built in Europe please contact us. If you can`t write down the information just call us and we will do it for you. At the firm Flobergs Biltarnsport in Goteborg Sweden they used this type of AA trucks. The cowl and hood was in darker color than the cab. The front bumper the normal AA bumper and the shell and lights were black. 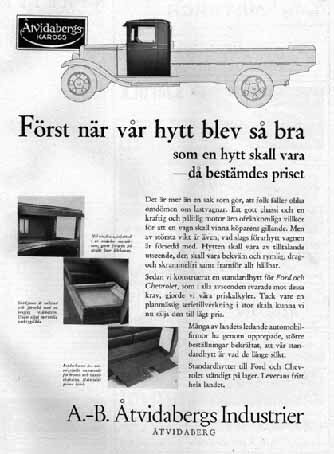 One of the trucks below is from an Ad that Ford published in Fordvärlden 1932 and it has some interesting things I think we can look at. No rear fenders just some piece of splash metal in front of the rear wheels. The running boards were very long and it looks like that they were cowered with rubber. The cowlband was painted in the same color as the moldings and radiator shell and headlights were black. The license plate is a interim plate that you have on your car for maximum one month before you got the correct license number. They were red with white text. A stands for Stockholm. B was just outside Stockholm and C was Uppsala. That was a nice system as you could se from what place in Sweden a car came from. This picture (see below) is from Fordvälden 1932. The pricelist gives the information that a A Chassis was priced at 2100:-skr ( approx 350 dollars ) and if you wanted a closed cab ( paketvagn) you had to pay 110 dollars extra. That was 38,5 % more than just for the chassis. Ford Service warranty and service was really good. What do you say about this? 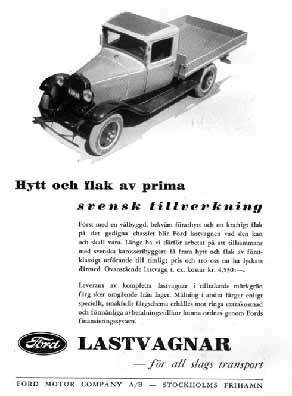 In Denmark 1929 we found following information to read in “Ford Magasinet”. The AA is classified as 11/2 ton truck but with twin rear wheels it can load over 2 tons. 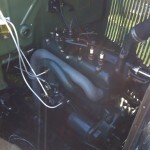 There is no doubt about that the Ford AA is especially strongly built with first class material. The weight was just 2282 English pounds. Strange to find the weight in Pounds, but it was given that way. the wheels were spoke wheels and the bodies were built in Denmark. This truck (see picture below) was built for pig transport. The sunvisor is extremely long and the front window is bigger than we normally see. 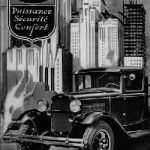 To take care of the car was a specialty for Ford but someone had to take care of us. How about a ride in this Ambulance (see picture below) ? It was delivered by The Ford dealer in ESBJERG, Hr.A:E:D: Bruhn. 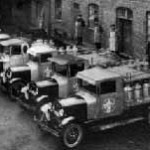 THE Ambulance was manufactured at Bruhns own garage. The Ambulance was equipped with long soft springs and “Lovejoy” shocks. The tires were balloon tires 32×6,00. The body was built on wood and covered with aluminum. The interior was covered with white artificial leather. And the inside floor with linoleum. The runningboards were covered with rubber and the running board trim were made of solid brass and nickel plated. 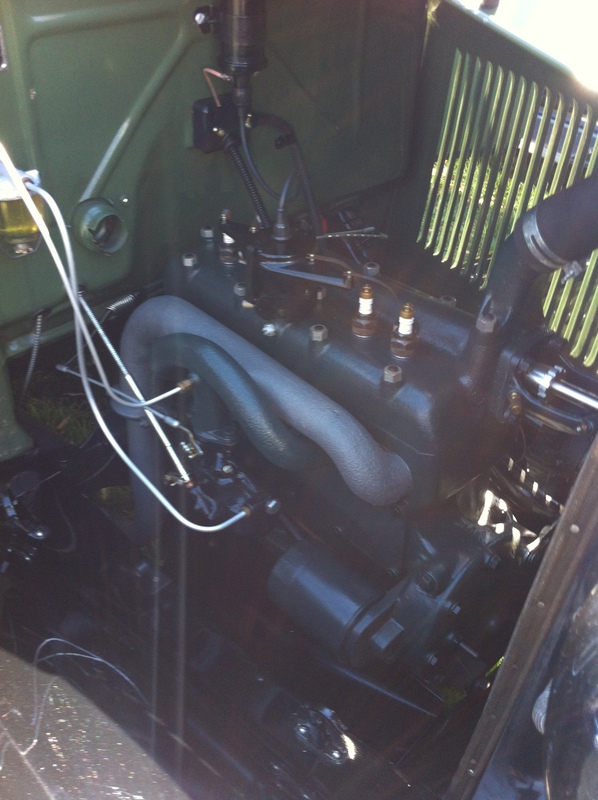 The car was also equipped with extra heating system to be used during cold winter days. In the summer cold air to the patient compartment was arranged via a special tube construction. Almost AC. There were also inside lights placed in the roof and they was activated by opening some of the doors. Special lights were also placed on several places inside the car that all could be turned off or on by the driver. The drivers comfort was also very good. For safety the car had a strong hedlight placed at the left windshield post. The total weight was 1650 kg. Very Good Indeed. Look closely and you find the turn signals in front on the windshield posts. It also had a outside mirror and automatic windshield wiper. A nice AA indeed. The fenders were in the same color as the body and there are also some other interesting things to look at. There is only one rear lamp and it is placed on the right rear end! You find a rear runningboard under the body but for how long was that one intact ? The runningboards seems not to fit so properly towards the front and the rear fender. Maybe they were made of wood and some thicker than normal and therefore came a little bit higher up on the body. Ambulances normally have red lights but this one have not got that yet. No extra sirens are visible but the Ford horn is there and it`s painted in the bodycolor. The front lights are painted but the rims looks like nickel or black. The radiator shell is in bodycolor. The body manufacturers in Sweden were several small and some bigger ones. 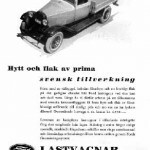 Åtvidaberg was one of the most known and they are still making bodies for trucks and commercial cars. 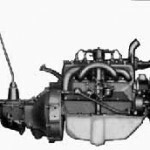 It is interesting to see the forms and sizes of the body they had chosen to the Ford AA chassis. In size it is a little bit wider and longer than the US cab. The same body was also used for Chevrolet. (A Chev and Ford with the same body, yes but it was a long time ago.) .